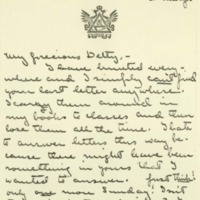 Eleanor Wilson McAdoo sends Jessie Wilson Sayre a letter with news from St. Mary's School, in Raleigh, NC. I have hunted everywhere and I simply can't find your last letter anywhere. I caryry them around in my books to classes and then lose them all the time. I hate to answer letters this way because there might have been something in yours that I wanted to answer. Just think! only one more Sunday! Isn't that perfectlyglorious? I can hardly believe it and I get so excited thinking about it that I feel like screaming. But in a few days I'm afraid I won't have any enthusiasm left because those horrible exams are going to take all the joy and happiness entirely out of me for a little while, at least. Don't be at all surprised if you hear that I have flunked a few for I fully expect to flunk at least three. When do yours begin? and are you very scared? I don't see why you should be. But, oh my, don't lets talk about them, yet, anyway! I suppose I will have to do what you say—just run out and see you for a few minutes on my way up—but, oh dear, I do want to see you for a long, long time so bad! I wish we could manage it. I have found out that the Baltimore girls may not go on that 1.40 train at night but may go on a train that leaves here at one in the middle of the day and doesn't get to Baltimore until about twelve at night. Of course I couldn't go on that one and, since Crook doesn't go up until a good deal later, as far as I can see I rshall have to travel at night by myself—maybe with the little girl who went up with us before. I suppose there won't be any harm in doing it. I have asked Mother if she would mind? It's supposed to get to Baltimore at 11.30 in the morning and it probably won't be as late as it was last time, so maybe I could stop off for and hour or two after all. But I will tell you what I arrange to do in my next letter, after I have consulted Crook and a few other people and have heard from Mother—Nothing particular has happened this week except a concert by the Mandolin and Guitar club. It was very good and the girls played beautifully. One part of the concert was a “trio” (I suppose that's what its called) pl by three dear little girls—two of them twins just about eight and the other only about seven—three little sisters.—One twin played the piano, the other the violin and the littlest the mandolin. It was the cutest thing you ever saw and they played very well too and weren't scared a bit—at least they didn't show it. The one at the piano counted one—two—three, one—two—three quite loud for the others to keep time by. it It was too cute for anything. McAdoo, Eleanor Wilson, 1889-1967, “Eleanor Randolph Wilson McAdoo to Jessie Woodrow Wilson Sayre,” 1907 May 20, WWP17396, Jessie Wilson Sayre Correspondence, Woodrow Wilson Presidential Library & Museum, Staunton, Virginia.